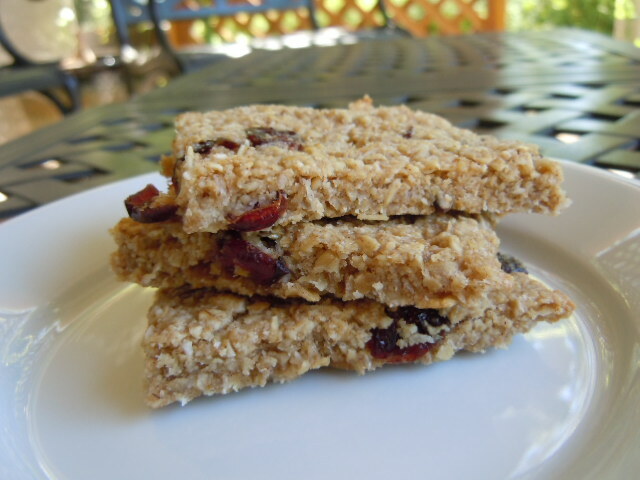 Years ago when my mom and I went to England together we ate some little sweet oat squares that were called Flapjacks. Here in the U.S. when we hear “flapjacks” we think pancakes. The flapjacks I am referring to are more like a bar cookie! We loved them but never found a recipe that was as good as what we had in England. That is until now, this recipe from the new Engine 2 My Beef with Meat book is easy and tasty. 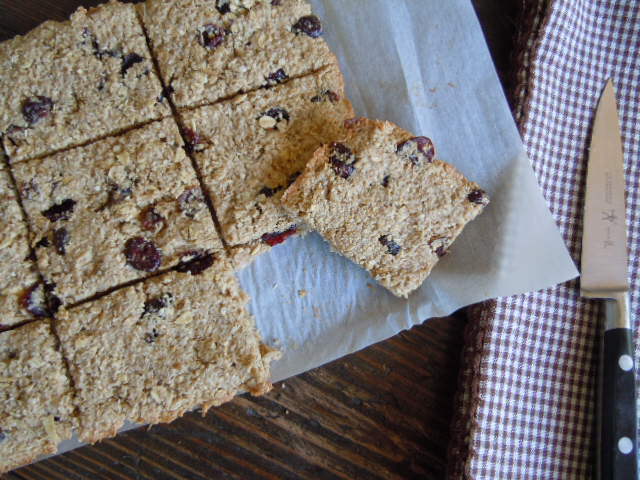 The oat bars are thin but big on flavor. I took the liberty of using more cinnamon and adding unsweetened shredded coconut which worked out well. Perfect for when you just need a little something slightly sweet to satisfy your sweet tooth. A nice little treat to take along to work, on a road trip or in a protective container in your backpack for that next hike or bike ride. These will be made often at my house. Family and company approved. You must make these ASAP! Preheat oven to 350 degrees. Line an 8 x 12 or 9 x 11 pan with parchment paper leaving the ends long enough to use to lift the bars out of the pan after they are baked. Place nuts and water in food processor and process until it becomes a big lump. This will require shutting the machine off and scraping down the sides with a rubber spatula a couple times. The nuts add a healthy fat to the recipe as well as flavor. Add maple syrup, vanilla and cinnamon, process until well combined. Add oats and gently pulse to mix or transfer the mixture to a medium size bowl, add oats and mix well. Add unsweetened coconut and dried cranberries (or other optional ingredients) mix until well combined. Press the mixture into the prepared pan spreading it out evenly. It will be a thin layer and it will take a little work to spread as the batter is stiff. A wide rubber spatula works well to smooth out and spread the batter. Bake for 20-25 minutes or until golden around the edges. Remove from oven and while still warm, using a sharp knife, score into 12 bars. Set aside to cool. When cooled completely use the long parchment ends to lift the bars out of the pan to a cutting surface. With a sharp knife cut bars apart. Store in a covered container in the refrigerator as they don’t contain any preservatives. My changes were to increase the cinnamon and add unsweetened shredded coconut.